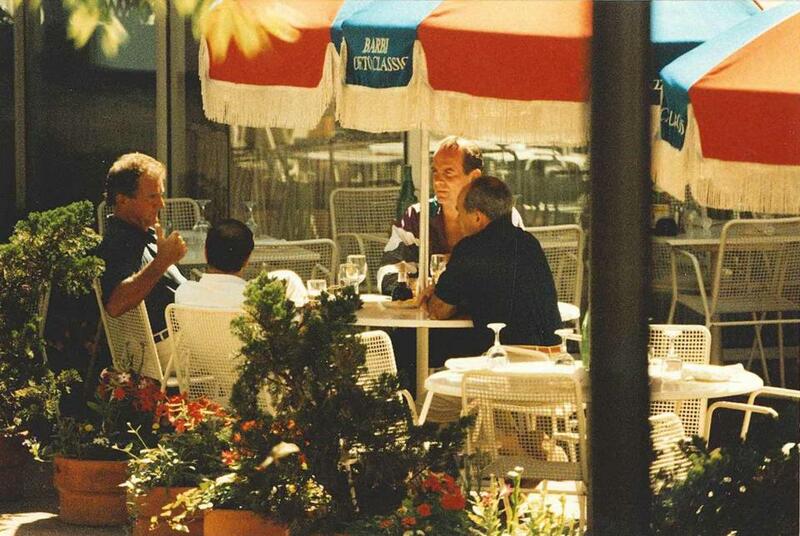 An FBI surveillance photo from 1993 shows Francis “Cadillac Frank” Salemme on the left; his son, Frank Jr. on the right; Stephen Flemmi with his back to the camera in a white shirt; and Rhode Island mobster Louie “Baby Shacks” Manocchio. In an effort to disguise two undercover agents expected to testify in the trial of Francis “Cadillac Frank” Salemme, the government is going to use a “movie-industry” quality makeup artist. At federal court in Boston Wednesday, U.S. District Court Judge Allison Burroughs chastised Smith for making the issue a public matter in the first place. Assistant U.S. Attorney Fred Wyshak said prosecutors want to call the inspectors to testify in an effort to show Salemme fled when he learned he could be arrested. Salemme was apprehended in August 2016 and charged with murder of witness for the 1993 gangland slaying of Steven DiSarro. At the time, Salemme had been relocated and given a new identity after testifying in a separate mob trial. Wyshak said Salemme was taken into custody in Milford, Connecticut, with $28,000 cash on him and a suitcase full of clothes. “There were conversations between field agents and Mr. Salemme - whether or not it should have occurred - it would have heightened Mr. Salemme’s concern about the possibility he could have been arrested,” Wyshak said. The possibility of bringing in a screen to shield the identity of the investigators from the public in the courtroom, but still keeping them in the view of the jury, was previously rejected by the judge, who referred to one of the unnamed witnesses as "bachelor number one." Mark Shea, an attorney for codefendant Paul Weadick, said defense lawyers object to the idea of clearing the courtroom, or having the witnesses wear sunglasses and a hat. He added that those optics would be "very damaging to the defense." One of Salemme’s defense attorneys, Elliot Weinstein, suggested utilizing a “movie industry” quality makeup artist – at the Marshals' expense – to mask the witnesses' identities. Smith said he was unfamiliar with the process, but since the witnesses weren’t expected to be called until the end of the prosecution’s case, there would be time to work out logistics. Burroughs signed off on the idea. Salemme, 84, and Weadick, 62, have been on trial for two weeks in the murder of DiSarro, who was a Boston nightclub owner and Providence native. Prosecutors have said the pair – along with Salemme’s late son – killed DiSarro because they feared he was going to cooperate with the FBI. Salemme and Weadick have both pleaded not guilty. Testimony in the trial was abruptly canceled Monday and is expected to resume next week. Neither prosecutors nor defense attorneys would reveal what has caused the delay.